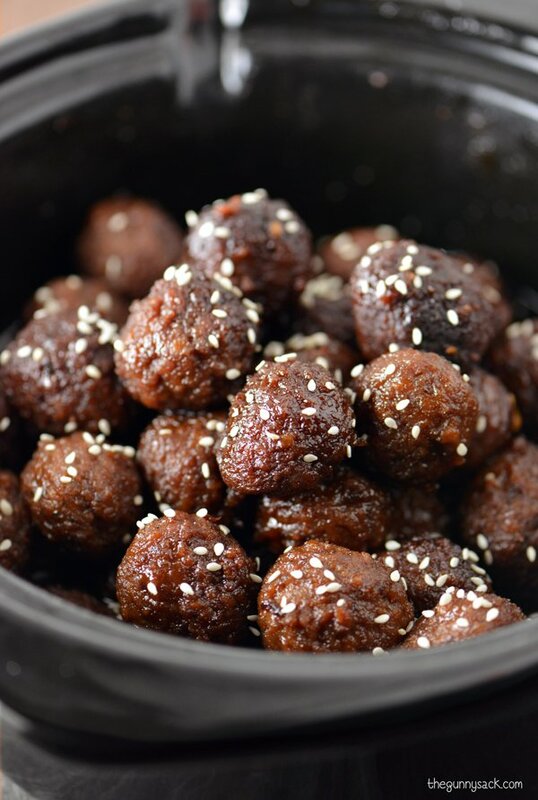 Slow Cooker Honey Sesame Meatballs can be served as a party appetizer or over rice for dinner. These sweet and spicy meatballs are a crowd pleaser! Welcome back from a break and happy Monday! I am feeling rather groggy today. It has been more than two weeks since we’ve had to get up before the crack of dawn. But it is time to switch from vacation mode, back into work mode. Three of my crockpot recipes were in the 20 most popular recipes from 2014, which tells me that all of you love using your crockpot as much as I love using mine! So, I am going to try to share more slow cooker recipes with you this year. 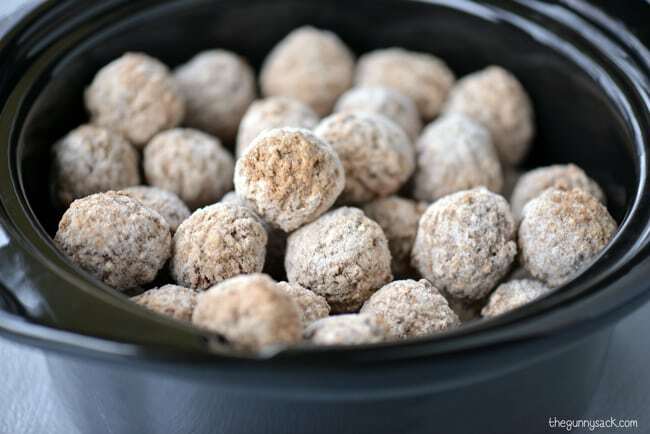 The first recipe I want to share is for Slow Cooker Honey Sesame Meatballs. They are similar to Slow Cooker Honey Sesame Chicken and can be used as a meal or as an appetizer. 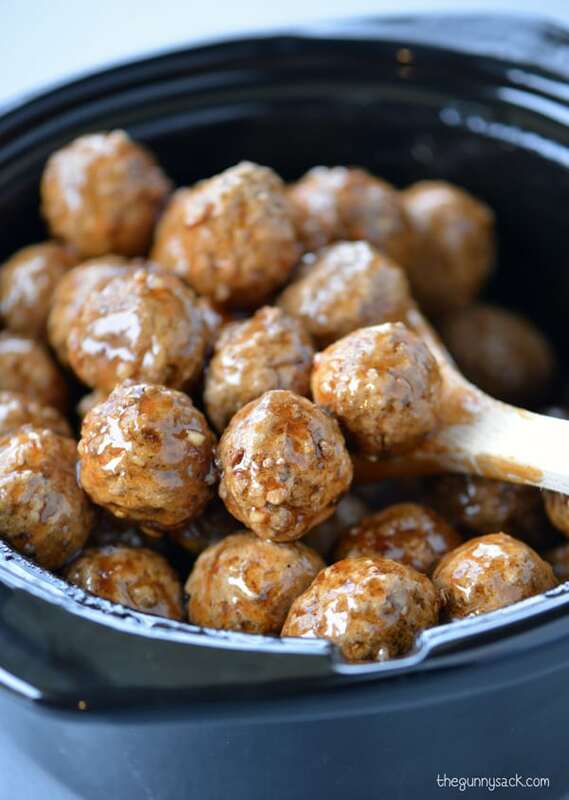 Pour one 2 pound package of about 50 fully cooked, frozen meatballs in your slow cooker. For this recipe, I used my 3.5-quart crockpot but a bigger one works too. And if you want to save on clean-up don’t forget to use a crockpot liner. 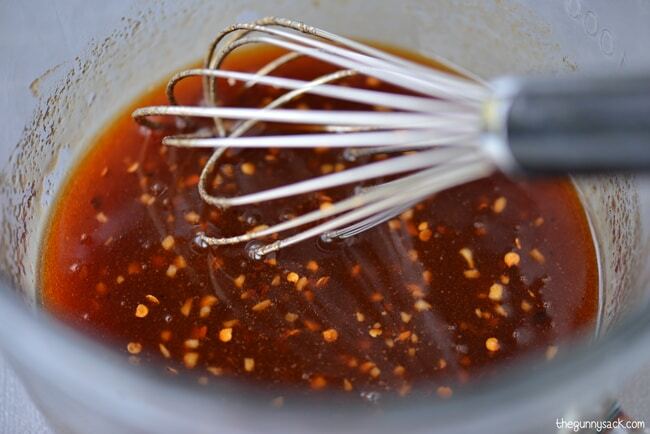 Whisk together honey, soy sauce, sesame oil, garlic, barbecue sauce, crushed red peppers, and brown sugar. Pour the honey sesame sauce over the meatballs in the slow cooker. Cook the meatballs on high for 3 1/2 to 4 hours or until they are heated through. Stir the meatballs every hour for a more even coating of sauce. 1. How long do you cook meatballs on low in a crockpot? Cook them on low for 6-7 hours or on high for 3-4 hours. The length of time will depend on your slow cooker. Cook them until they are heated through. 2. Can these be made in the oven instead of a slow cooker? Yes, they can be made in the oven. Spread the meatballs in a 9×13 pan. Add the sauce and stir to coat. Cover with foil and bake at 400˚F for 35-40 minutes until heated through. 3. What is sesame seed oil and do I have to use it for this recipe? Sesame seed oil is an oriental seasoning oil that is 100% sesame seed oil. A very small amount adds a ton of flavor. It can be left out if you don’t have it on hand but the flavor will not be the same. 4. How should I store the leftovers? Leftover meatballs can be stored in the fridge in an airtight container for 3-4 days. 5. 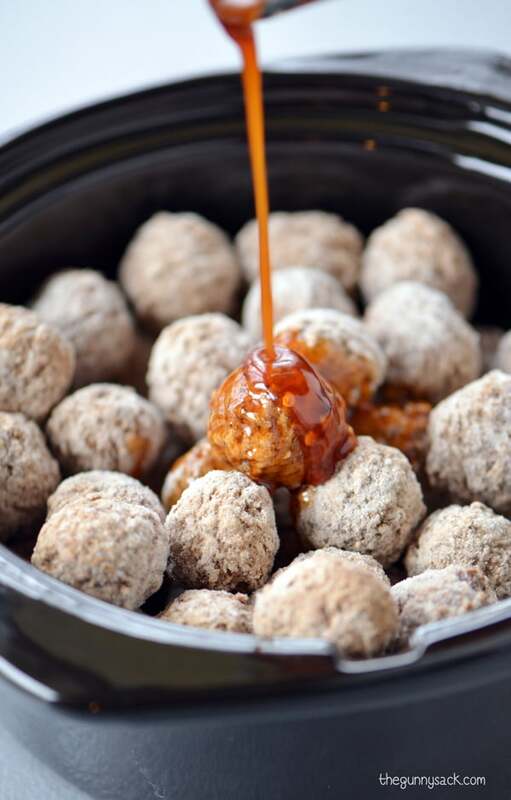 Are this slow cooker honey sesame meatballs recipe gluten-free? You can make this recipe gluten-free by making sure your meatballs, barbecue sauce, and soy sauce are gluten-free. Slow Cooker Honey Sesame Chicken is easy to make, cheaper than takeout and tastes better too! It’s a family-friendly recipe that will become a favorite. Slow Cooker Chicken Alfredo Tortellini is warm, comfort food at it’s finest. This easy, crockpot recipe will quickly become a favorite family dinner! Put the frozen meatballs into slow cooker. In a small bowl, whisk together the honey, brown sugar, barbecue sauce, soy sauce, sesame oil, minced garlic and crushed red peppers. Pour the sauce over the meatballs and stir to coat. Cook on high for 3 1/2 - 4 hours, stirring every hour, until heated through. If cooking these on low instead of high, how long do you think this will need to go? I am thinking of making this for our work Christmas luncheon. I’m guessing they would take an additional two hours. Best of luck! These recipes look so good! Can’t wait to try them. Thanks so much for sharing! Thank you Tonia for all the nice recipes. Happy New Year! I’m not a huge of regular meatball sauce, but we love honey sesame chicken, so I know I would love these meatballs! Great twist Tonia! Tonia, I love how easy this recipe is and would make some great game day food! Pinned! Everyone should always have a great slow cooker meatball recipe on hand! So simple and delicious! I love making meatball recipes in my slow cooker!! and with the weather we’re having here in wisconsin right now (it’s like 4 degrees, was -8 this morning! ), my slow cooker will take permanent real estate on my kitchen counter!!! 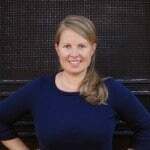 love this recipe, Tonia!! Pure deliciousness! I love anything with sesame seeds. Can’t wait to try this. I’m still on vacation mode too 🙂 Great slow cooker idea- these look amazing! Perfect for a party! I’ve wondered about different ways to use those frozen meatballs – I never though of using the slow cooker! Wow, brilliantly easy w/the use of a slow cooker and w/delicious flavors. Great recipe, definitely sharing on Pinterest! I LOVE this idea! Much as they are a tradition, I get pretty tired of the grape jelly/bbq sauce meatballs that are typically offered up at gatherings. This looks like an incredible sauce. My kids would love these over rice for dinner, and BONUS. EASY!! This looks perfect for our Super Bowl party! I just came across some gluten-free meatballs the other day, so with just a bit of tweaking, I can make your recipe gluten-free. Thanks for sharing! I am all about slow cooker meals this time of the year. These sesame meatballs look amazing. Perfect game day appetizer too! I’ve been using my slow cooker a lot more lately and this meatball recipe looks like one that needs to be added to our menu soon! Love how easy it is! These meatballs are killer! And that sauce is mouthwatering. I need to make these soon! Pinning! These look fantastic!! What a great game day appetizer!